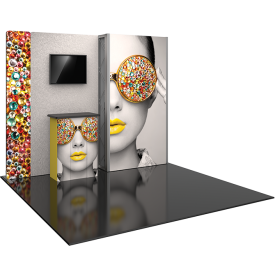 Wow any audience with the clean, contemporary appearance of Vector Frame™ Modular Displays. 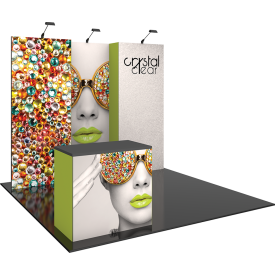 Available in Essential and Master collections, these backwalls, banners, exhibit kits and more are easy-to-assemble, reconfigurable and customizable display solutions. Vector Frame displays couple simple aluminum extrusion frames with push-fit SEG fabric graphics to provide a modern and stylish appearance. These systems feature accessories such as counter displays, shelving, literature holders and lighting. Backlit graphics are also available to make branding and messaging stand out from the crowd. Make a strong and lasting impression in a retail environment or at the next trade show or event. Find your solution today!